3 Ingredient Vegan Caramel Sauce is easy to make and perfect for topping non-dairy ice cream, Vegan Salted Caramel Skillet Cookie, or any other dessert! Comes together in just 5 minutes. 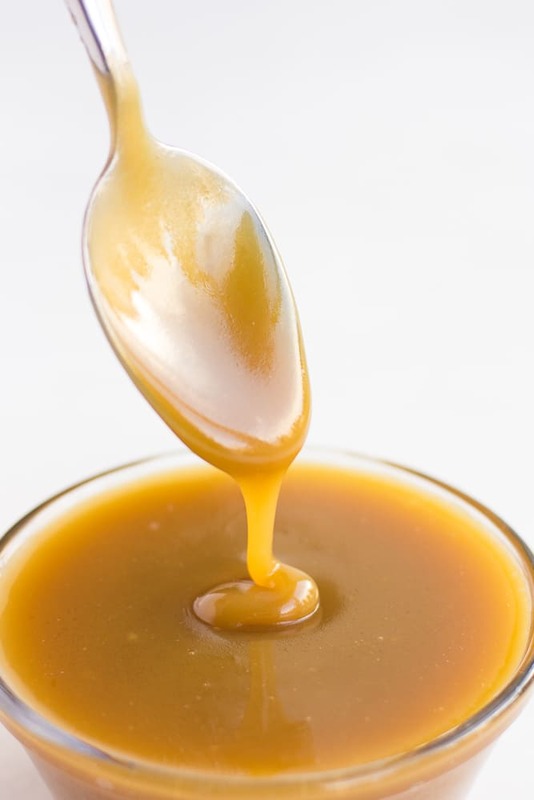 Finally, a truly easy vegan caramel sauce made with just 3 ingredients (+ optional salt) in about 5 minutes flat! It will come together like magic before your eyes. I really, really, really used to love caramel. 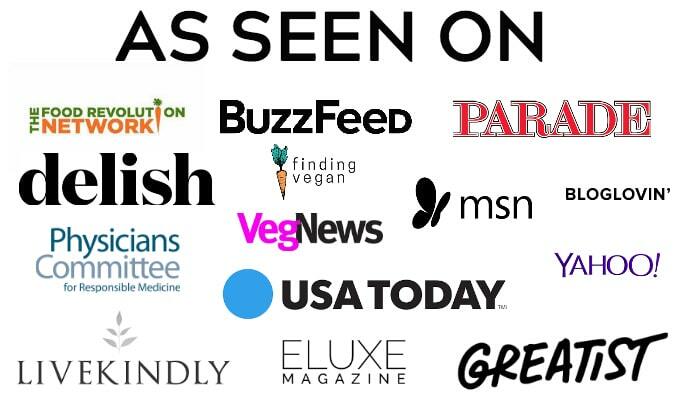 And I just haven’t found a good recipe since going vegan, let alone an option to buy at the grocery store. I wanted to come up with a super easy, quick and delicious recipe I could rely on anytime I get a caramel craving. 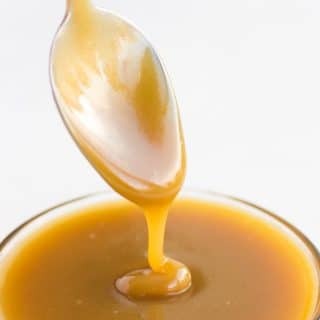 How do you make Vegan Caramel Sauce? 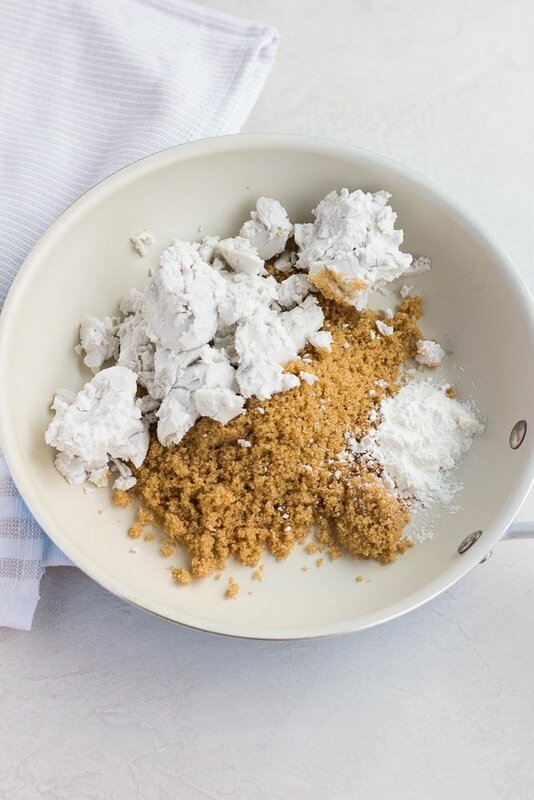 Add 1 cup of coconut cream, 3/4 cup brown sugar and 1 tablespoon cornstarch to a small pot or pan. NOTE: I buy coconut cream for this recipe, but you can also use full fat coconut milk. Simply scoop out all the white, thick parts until you have a cup. Heat over medium-high heat, stirring constantly, until the coconut cream melts. Bring to a boil. It will get bubbly and almost foamy. Lower heat to a simmer, and stir frequently for about 5 minutes. Remove from heat. You can use it straight away, or let it cool. It will become thicker as it cools, and become a little lighter in color. 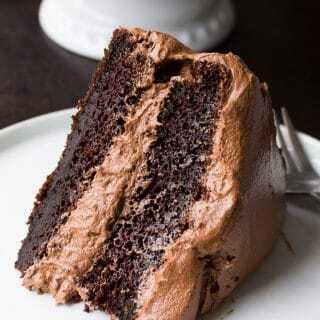 Either way is delicious! 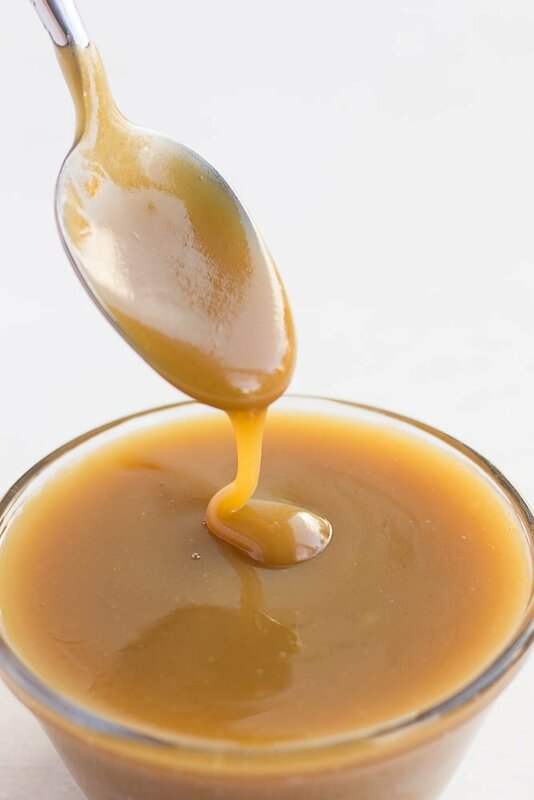 Store leftover caramel in a covered container in the refrigerator for up to 1 week. Give it a good stir each time you use it. There are so many possibilities for this Vegan Caramel Sauce! 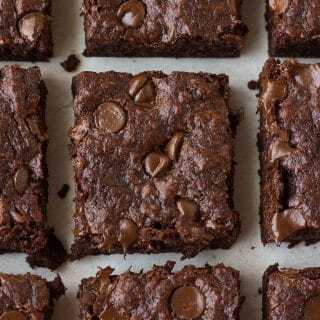 Try it drizzled on ice cream, Vegan Salted Caramel Skillet Cookie, Apple Crisp, Cheesecake, drizzled on Chocolate Cake or Brownies, Monkey Bread or Hot Chocolate. 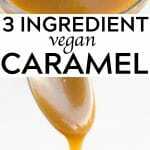 3 Ingredient Vegan Caramel Sauce is easy to make and perfect for topping non-dairy ice cream or any other dessert! 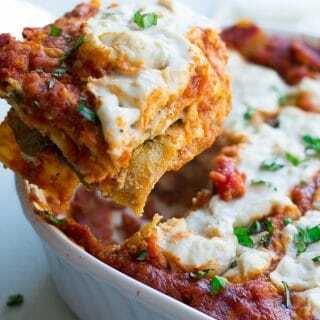 Comes together in just 5 minutes. In a small pan or pot, add the coconut cream, brown sugar and cornstarch. Heat over medium-high heat, stirring constantly while the coconut cream melts. The mixture will get bubbly and almost foamy. Lower the heat to a simmer and stir frequently for about 5 minutes. If you want salted caramel, add a pinch of salt. Remove from heat. 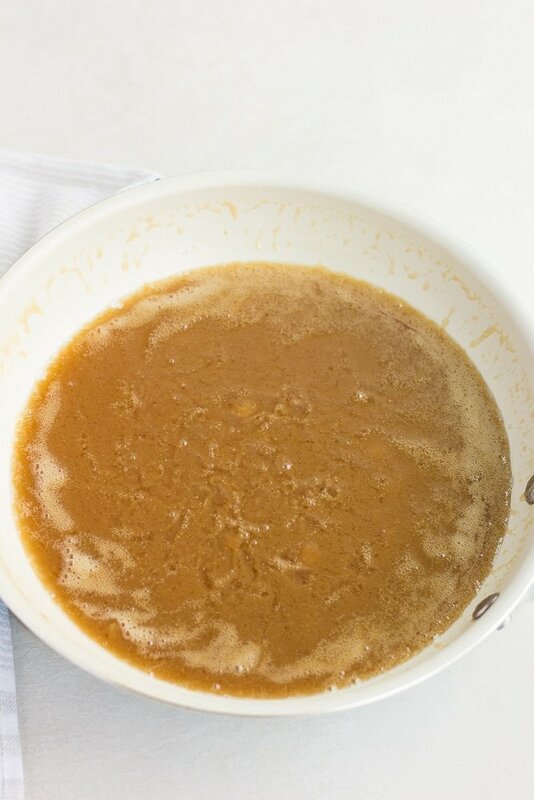 The caramel can be used immediately, or let it cool and it will thicken considerably. Each time you go to use it, give it a good stir. 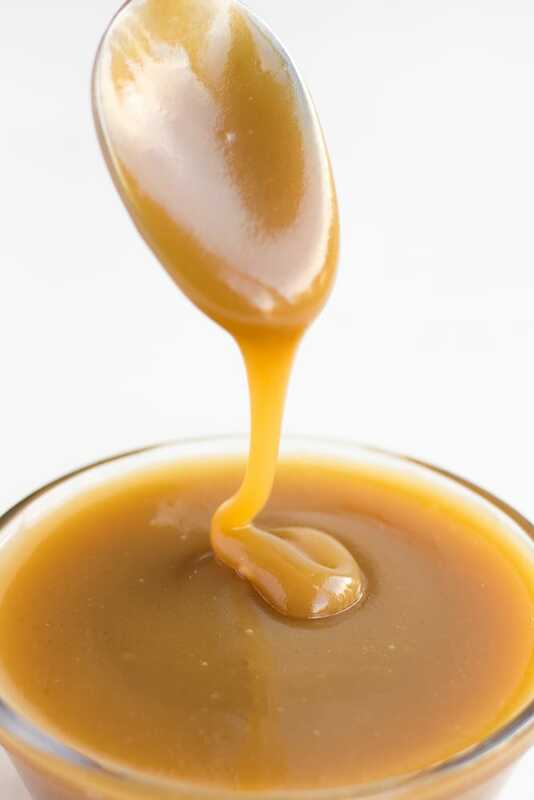 Store leftover caramel in a covered glass container in the refrigerator for about a week. I like to buy coconut cream for this recipe, but if you can't find it you can use full fat coconut milk. Simply scoop out the thick white part, and leave the liquid in the can. May sub coconut sugar for brown sugar if desired, but I prefer brown sugar. May sub arrowroot for cornstarch if desired.